One of the major issues that plagued the SMA industry in years past was inventory control. There are countless situations where we’d work hard to get a prospect committed, only to have the case pulled out from us and sold to someone else. Managing Secondary Market Annuity inventory was a real chore. Even today, there are other vendors of SMAs who still leave you hanging, working on a ‘best efforts’ basis, yet they have no control over the inventory. It’s a horrible feeling to get a client excited and committed to a deal, have them fall in love with it, only to have to go back to them and tell them they did not get a case. But now with In Stock inventory, those issues are gone forever. 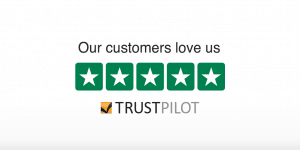 All our inventory is posted online and is exclusively controlled by us. When you offfer your clients our In Stock cases, you and your client know, with certainty, exactly what you will get, and you can get it quickly! Our inventory of available cases is displayed on our website and dynamically updated. We also make web-based streamed inventory available to our advisors and can customize output to your web site or in PDF format for email to your clients. Sitting and watching the inventory, waiting for the right case to pop up can be inefficient. The displayed inventory is also just a fraction of what is available. It is more effective to contact us with the parameters of what your clients are looking for and allow us to fill specific orders. An SMA designated as In Pipeline is in the court approval process. It may or may not yet be court approved, or it may be awaiting documentation. It is possible these SMAs may not become available for purchase. 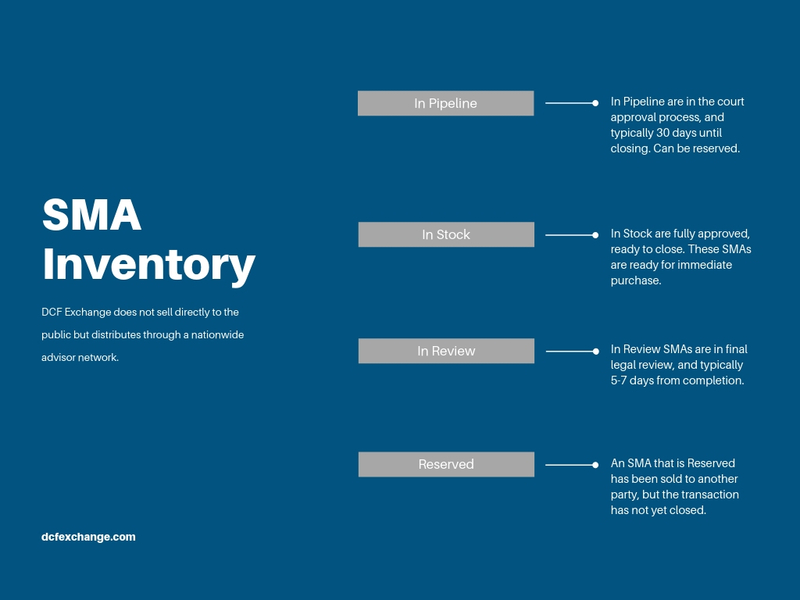 You may reserve an In Pipeline SMA for your client, but understand that the transaction may take more time and the case is not guaranteed to close. We do everything we can to keep transactions together but if the transfer fails, we will promptly let you know why. An In Pipeline SMA typically takes 30 days to close. An SMA that is In Stock is ready for immediate sale. In Stock SMAs have been thoroughly reviewed and the court transfer and approval is complete. These SMAs are ready for immediate purchase. In Review SMAs are in final legal review, and typically 5-7 days from completion. An SMA that is Reserved has been sold to another party, but the transaction has not yet closed. We do accept backup offers so be sure to look at reserved listings in addition to In Stock and In Pipeline. DCF Exchange does not sell directly to the public but distributes through a nationwide advisor network. Advisors can log-in for inventory, training, and appointment details.